The Coventry P.E.A.C.E. 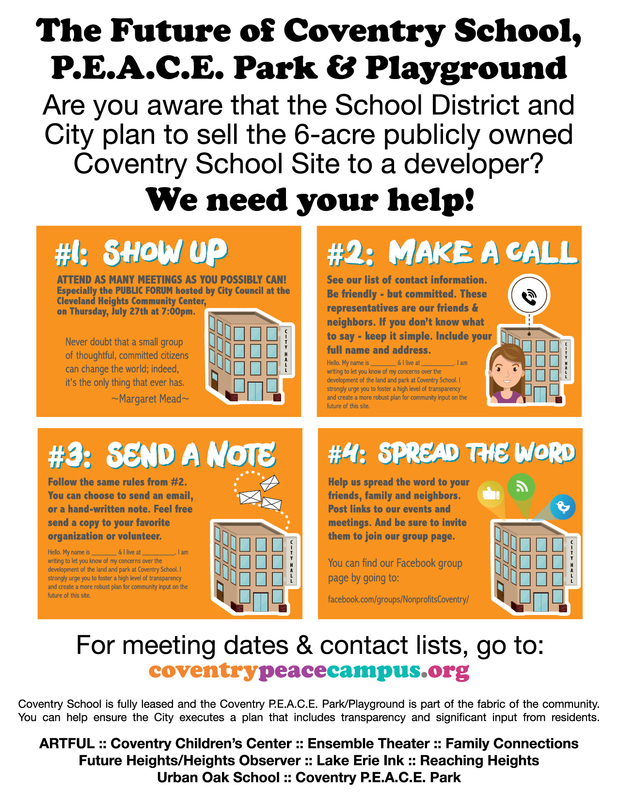 Campus property (Coventry School and Coventry P.E.A.C.E. Park & Playground) are currently owned by the CH-UH School Board. In May of 2017, the School Board announced to the tenants that they would not renew the yearly leases in July, and would be placing the tenants on month-to-month leases with 30 day notices to vacate, all to facilitate a sale of the property to the City and make way for the property to be developed. Concerned for the future of their organizations, the tenants rallied together, and worked with residents to make their case for being granted a full year lease so that they can properly, and thoughtfully plan for the future of their organizations. These organizations were recently told the City will draft a Memorandum of Understanding (MOU) stating the tenants will not have to vacate the property until June 30, 2018. This is only the beginning step in trying to ensure these organizations are able to plan thoroughly for their futures, while also maintaining current programming. With the help of volunteers from areas such as architecture, city planning and marketing, Coventry P.E.A.C.E. Campus is currently researching the viability of an Arts, Culture and Education Center. No matter the outcome, it is of utmost importance that residents have the opportunity to have their voices heard and their representatives are made aware of their concerns and ideas for this important piece of property. Coventry P.E.A.C.E. Campus has been working since May to urge the City to make the process more open and transparent, and helping to provide information to the citizens of Cleveland Heights, and beyond, so that they are able to make their voices heard. As we continue this dialogue with our community and City leaders, we hope that you will join us in voicing your opinions to those in positions where decisions are made. Your help is GREATLY appreciated, and we hope to see you at important upcoming meetings like the Public Forum, hosted by City Council on July 27th at 7:00 pm, located at the Cleveland Heights Community Center. Below you will find the contact information for key City officials, or you can download a print version here.